3,Chemsford Road, New Delhi – 110 055. 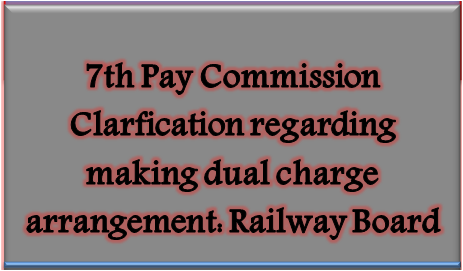 Subject: Clarfication regarding making dual charge arrangement under 7th CPC- reg. Ref:NFIR’s letter No.1/5(g)/Part VI dated 16.04.2018. The undersigned is directed to refer to your letter under reference and to advise that the matter is under active correspondence with DoP&T for laying down of detailed guidelines for grant of additional post allowance in place of the erstwhile dual charge allowance. DoP&T for laying down of detailed guidelines for grant of additional post allowance in place of the erstwhile dual charge allowance.